Objective To synthesise the existing published literature on the perceptions of general practitioners (GPs) or their equivalent on the clinical management of multimorbidity and determine targets for future research that aims to improve clinical care in multimorbidity. The metaethnographic approach used in this review gave a broader understanding of the challenges of multimorbidity than any single study, while still preserving the context of included studies. We focused on the general practitioners’ perspective on multimorbidity—an understanding of the challenges experience by patients is also required to inform the development of effective interventions. The epidemiology of multimorbidity is thus well described, and there is currently a need for interventions to improve healthcare in this patient group.8 ,9 A necessary step in the development of interventions is to understand why problems arise and what processes in the delivery of care are amenable to change. Interviews with stakeholders, such as healthcare providers, can be important sources of this information.10 To date, qualitative studies from a range of countries have elicited general practitioners’ (GPs’) views on challenges in the clinical management of multimorbidity, with diverse and sometimes conflicting findings. A synthesis of these studies has the potential to achieve a greater conceptual understanding of the challenges associated with multimorbidity than a single empirical study. An awareness of the overall picture of the challenges faced by GPs in multimorbidity is needed to direct research efforts and intervention design in this field. To achieve this, we synthesised and analysed the existing literature on the views of GPs on the management of multimorbid patients and determined targets for future research to improve multimorbidity care. The seven-step model of metaethnography described by Noblit and Hare13 was used. The first step involved a clear statement of the specific research question and the contribution it will make to the field. In step 2, a search strategy was devised to retrieve articles related to this aim. We focused our search to locate primary studies that used qualitative methods to explore the clinical management of multimorbidity or multiple chronic diseases by GPs or their equivalent. We searched seven databases using database-specific search terms and validated methods for retrieving qualitative studies: EMBASE (Elsevier), MEDLINE (Ovid), CINAHL, PsycInfo, Academic Search Complete, SocIndex, Social Science Full Text (all Ebsco; see online supplementary appendix 1).14–17 We supplemented this by searching databases of grey literature and reference lists. The search was not limited by language or dates of publication. The titles and abstracts of retrieved citations were read by one reviewer (CS). Full articles were ordered for all potentially relevant abstracts.18 These articles were reviewed by two researchers (CS and CB) and were included if they fulfilled our inclusion criteria. Studies that examined the management of multimorbidity as part of a wider research question were included. We assessed the quality of included studies using the Critical Appraisal Skills Programme (CASP) for qualitative research.19 Assessment of study quality was not a criteria to exclude studies that otherwise met the inclusion criteria, but gave useful insights into the methods used for data collection and analysis. Step 3 of the metaethnographic synthesis involved reading the studies. Initially two reviewers (CS and CB) read and re-read the included studies, and independently listed the main findings from each one. Study findings were defined as all data in the results and discussion sections of the included articles—including both the first-order interpretations (views of the participants) and second-order interpretations (views of authors). In studies in which GPs were interviewed with another healthcare professional, the analysis was restricted to the views of the GP where possible. In step 5, studies were translated into each other by examining the contribution of each study to a key concept. Within the key concepts, similarities and differences in study findings and contexts were noted, and deviant cases were sought. To address the potential for clinical bias a third reviewer with a non-medical background (SMH) independently read all included articles and cross-checked the derivation and development of the key concepts. In step 6, we synthesised the translations in each key concept to develop third-order interpretations, or higher levels of abstraction of the data for each key concept. We linked the third-order interpretations using a ‘line of argument’, which represented the overarching perspective of GPs towards multimorbidity. The final step involved expressing the results of the synthesis, for which we used tables, figures and text. The ‘Enhancing transparency in reporting the synthesis of qualitative research’ (ENTREQ) statement was used to inform the reporting of our results (see online supplementary appendix 4).22 Additionally, a summary of our findings were provided to the first authors of all included articles, to validate our findings as representative of the original sources. 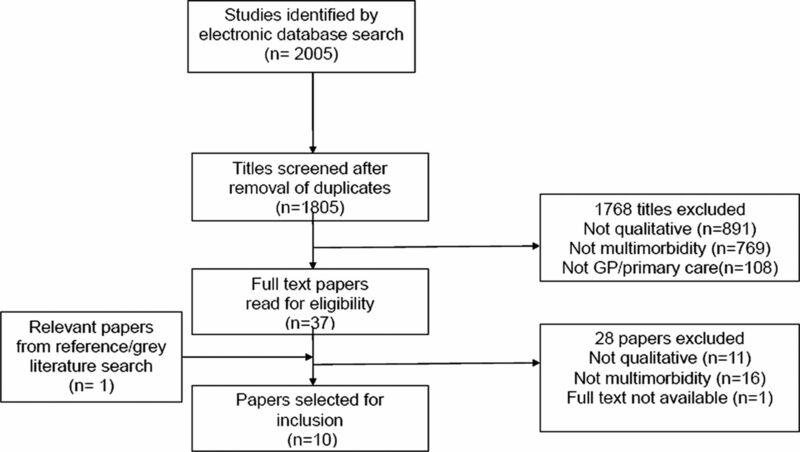 The electronic database search returned 2005 citations, leaving 1805 citations after removal of duplicates (figure 1). A further 1768 citations were excluded by reading the title or abstract: 48 did not concern primary care, 891 were not qualitative studies, 769 did not concern multimorbidity and 60 did not concern the GP's perspective. Full-text articles were retrieved for 37 citations. Eleven of these were excluded because they did not use qualitative methods. A further 16 articles were excluded because, although they concerned patients with multiple chronic diseases, their exploration was focused on the management of an index disease. One possible relevant citation was in abstract form only (the study authors were contacted and the full account of this data has not been published yet; see online supplementary appendix 2). One additional study was retrieved from reference searching of the nine remaining studies. Ten studies were included in the final synthesis (table 1). GPs in all studies reported challenges in multimorbidity, which they faced with ‘moderate optimism to something close to despair’.30 Even in the context of deprivation, some participants reported feeling like a ‘wrung out rag’ after complex multimorbidity consultations while others felt ‘energised’ by the ‘privilege and rewards’ that could be obtained from working in such a complex environment.24 Four key concepts that reflected the principal findings of all included studies were determined. These are reported below and shown in table 2. Within each key concept, subthemes arose and are highlighted in bold. By synthesising the individual contributions of each study to the key concepts, third-order interpretations were generated and linked using a ‘line of argument’ (table 2). Disorganisation and fragmentation of healthcare: The involvement of multiple specialists and the emphasis on single disease care is antagonistic to the ‘holistic’ goals of GPs. This problem is compounded by poor co-ordination and communication within the health service, leaving GPs feeling excluded from their patients’ care and with a sense of uncertainty regarding their role. The inadequacy of guidelines and evidence-based medicine: Guidelines offer GPs less support in the management of multimorbid patients and may in fact cause additional problems when they try to adhere to them. Challenges in delivering patient-centred care: Patient centredness is an over-riding principal for GPs in multimorbidity but trying to achieve this increases the complexity of care in some cases, and can lead the GP into additional conflict with specialist services or evidence-based medicine. Challenges in shared decision-making: The patient's role in decision-making in multimorbidity is limited by difficulties in communicating risk benefit and outcomes in a field where there is much more uncertainty on these issues. These key concepts represent four problematic domains in the provision of healthcare in multimorbidity, as seen by GPs. The line of argument linking these domains suggests that GPs feel isolated in the management of patients with multimorbidity, a group that they are specifically tasked with caring for. The studies presented here used a bottom-up approach to explore the management of patients with multimorbidity. This article is the first to our knowledge to systemically review and synthesise their findings, and demonstrates the diversity in how GPs see this issue. The difficulties that GPs encounter span a number of clinical domains including system factors, the evidence base for chronic disease management and their own communication skills in the context of multiple physician and patient agendas. These findings are important because they highlight the separate but interacting areas of clinical practice that require intervention to improve care in multimorbidity. Thus, this study is additive to the findings of the individual studies reviewed; synthesising the contributions of existing qualitative investigations in this area has led to a broader description and fuller understanding of the range of challenges that exist. Given the considerable overlap and repetition of data that emerged from the primary studies, it is unlikely that further scoping work on the challenges in multimorbidity will be useful. However, despite the commonalities, the significance of each domain varied between settings. Further research should focus on the reasons why some domains matter more in particular settings and how local factors modify and influence these domains, with a view to exploring the solutions that exist and identifying those solutions.33 There will not be a ‘one size fits all’ intervention to support and improve the quality of care in multimorbidity. However, the domains that have emerged from this review give a useful framework for future work in this field. Integrating patient care across services is important in all aspects of medicine, but there is a pressing need to address this in multimorbidity. Patients attending four or more doctors experience problems such as conflicting medical advice, unavailable test results and duplication of tests more commonly.34 Our study indicates that, across settings, GPs receive poor communication from other care providers in multimorbidity, leaving them guessing about the course of management. Enhanced use of information technology may support more seamless multimorbidity care, by allowing bidirectional communication and local integration between care providers. Satisfaction with prevailing health systems also varied between studies. Generalisations relating to a health system cannot be made from one single study, but this divergence is worthy of further exploration. For instance, a comparative analysis, using a multimorbidity perspective, of the strengths and weaknesses between the UK system (which uses explicit quality frameworks for chronic disease management) and a health system without such an approach may help inform policy and the development of interventions at health system level. This domain emerged as an intuitive and over-riding goal of GPs in all studies, and interventions in multimorbidity must help GPs deliver on this aspiration. Continuity of care emerged as an important tenet of patient-centredness and should be promoted in any such interventions. Three subtypes of continuity of care have been previously described39; of these, both informational and management continuity were seen here as necessary for patient safety and cohesive management. However, it was relational continuity that appeared to most facilitate care in multimorbidity, by allowing GPs to foster trust, anticipate preferences and empower their patients over time. Multimorbid patients that GPs felt required particular assistance are those with cognitive impairment, mental health issues or low social support, and accordingly may require nuanced interventions to support their care. Shared decision-making is facilitated by many aspects of primary care.40–42 Nevertheless, GPs in the studies presented here sought additional skills in shared decision-making in multimorbid patients, especially for complex decisions that involve not prescribing or discontinuing medications. It is known that interventions to improve shared decision-making may fail due to barriers such as lack of time and perceived lack of suitability of the patient.43 ,44 Given the overlap between these barriers and those that GPs encounter in multimorbidity, it is likely that special attention is warranted for the development of models of decision-making for multimorbid patients. Evaluating existing models of shared decision-making, such as the choice talk/option talk/decision talk model described by Elwyn et al45, in clinical encounters with multimorbid patients may be a useful place to start this process. The systematic approach of metaethnography as applied in this study has several strengths. It provides a fuller description of multimorbidity care while preserving the important contextual features that are inherent in general practice research. Our themes, developed from the experiences of 275 participants, indicated considerable overlap from each of the primary studies. Nevertheless, different opinions within particular themes gave useful insights into how system factors and context can influence practice. The step-by-step approach followed in our analysis generated themes in a transparent and reproducible manner. The robustness of our findings is supported by several features. First, the quality of the studies reviewed was assessed using a published framework and quality levels were uniformly high. Second, there was concordance in the themes derived by non-clinical and the clinical reviewers on the research team. Third, the findings from our analysis were disseminated to the authors of the primary studies. In the resulting feedback, the authors felt that their results were represented within the findings of the synthesis. Multimorbidity is not a Medical Subject Heading (MeSH) term and there is a lack of consensus on what the term means or encompasses with regard to diseases and disease severity.46 We used a broad but less specific search strategy to account for this (see online supplementary appendix 1), which resulted in the retrieval of articles with important information on multimorbidity, but whose original focus was not on this issue. Achieving consensus on the definition of multimorbidity will be important for the generalisability of findings and evaluation of future interventions in this field. There was no language restriction used for inclusion of studies, and translations of potentially relevant titles and articles were conducted. However, we could have missed articles not listed on English language databases. Although the quality of included studies was generally good, the over-representation of academic GPs as participants was a potential source of bias and may limit the generalisability of our findings to the overall GP population. Future studies should endeavour to include GPs outside of the academic field to ensure that the full range of clinical challenges is explored. The primary data in our review originated from focus groups or clinical vignettes, reflecting what clinicians say rather than what they do. It would be valuable to use case-based data in future studies, to see, for example, what specific conflicts arise between guidelines and how shared decision-making is currently broached in practice. Such data would also help inform educational programmes in multimorbidity for GPs and GP trainees. This systematic review shows that the problem areas for GPs in the management of multimorbidity may be classified into four domains: disorganisation and fragmentation of healthcare; the inadequacy of guidelines and evidence-based medicine; challenges in delivering patient-centred care and barriers to shared decision-making. There will be no ‘one fits all’ intervention for multimorbidity but these domains may be useful targets to guide the development of interventions that will assist and improve the provision of care to multimorbid patients.
. Multimorbidity in general practice: prevalence, incidence, and determinants of co-occurring chronic and recurrent diseases. J Clin Epidemiol 1998;51:367–75.
. Low frequency of primary lipid screening among medicare patients with rheumatoid arthritis. Arthritis Rheum 2011;63:1221–30.
. The impact of concordant and discordant conditions on the quality of care for hyperlipidemia. J Gen Intern Med 2008;23:1208–13.
. Prevalence, expenditures, and complications of multiple chronic conditions in the elderly. Arch Intern Med 2002;162:2269–76.
. The prevalence of multimorbidity in primary care and its effect on health care utilization and cost. Fam Pract 2011;28:516–23.
. Multimorbidity's many challenges. BMJ 2007;334:1016–17.
. Multimorbidity: time for action rather than words. Br J Gen Pract 2013;63:64–5.
. Methods of synthesizing qualitative research studies for health technology assessment. Int Jo Technol Assess Health Care 2011;27:384–90.
. Evaluating meta-ethnography: systematic analysis and synthesis of qualitative research. Health Technol Assess 2011;15:1–164.
. Meta-ethnography: synthesizing qualitative studies. Newbury Park, CA: Sage, 1988.
. Developing optimal search strategies for detecting clinically relevant qualitative studies in MEDLINE. Studies Health Technol Inform 2004;107:311–16.
. Search strategies for identifying qualitative studies in CINAHL. Qual Health Res 2007;17:705–10.
. Developing optimal search strategies for retrieving clinically relevant qualitative studies in EMBASE. Qual Health Res 2006;16:162–8.
. Developing optimal search strategies for retrieving qualitative studies in PsycINFO. Eval Health Prof 2006;29:440–54.
. Conducting a meta-ethnography of qualitative literature: lessons learnt. BMC Med Res Methodol 2008;8:21. CASP Qualitative Appraisal Checklist. Critical Appraisal Skills Programme [Internet]. 2006. Joanna Briggs Institute Reviewers’ Manual: 2008 edition: The Joanna Briggs Institute. QSRInternational. NVivo qualitative data analysis software. 9th edn. 2010.
. Enhancing transparency in reporting the synthesis of qualitative research: ENTREQ. BMC Med Res Methodol 2012;12:181.
. GPs’ and pharmacists’ experiences of managing multimorbidity: a ‘Pandora's box’. Br J Gen Pract 2010;60:285–94.
. An ‘endless struggle’: a qualitative study of general practitioners’ and practice nurses’ experiences of managing multimorbidity in socio-economically deprived areas of Scotland. Chronic Illn 2011;7:45–59.
. Influence of patient age and comorbid burden on clinician attitudes toward heart failure guidelines. Am J Geriatr Pharmacother 2012;10:211–18.
. Primary care clinicians’ experiences with treatment decision making for older persons with multiple conditions. Arch Intern Med 2011;171:75–80.
. The compatibility of prescribing guidelines and the doctor-patient partnership: a primary care mixed-methods study. Br J Gen Pract 2012;62:e275–81.
. Multimorbidity, service organization and clinical decision making in primary care: a qualitative study. Fam Pract 2011;28:579–87.
. Deprescribing medication in very elderly patients with multimorbidity: the view of Dutch GPs. A qualitative study. BMC Fam Pract 2012;13:56.
. Polypharmacy: a dilemma in primary care? Results of group discussions with general practitioners. Gesundheitswesen 2009;71:339–48.
. GPs’ considerations in multimorbidity management: a qualitative study. Br J Gen Pract 2012;62:503–10.
. Bottom-up implementation of disease-management programmes: results of a multisite comparison. BMJ Qual Saf 2011;20:76–86.
. New 2011 survey of patients with complex care needs in eleven countries finds that care is often poorly coordinated. Health Aff 2011;30:2437–48.
. Clinical practice guidelines and quality of care for older patients with multiple comorbid diseases. JAMA 2005;294:716–24.
. Threads and yarns: weaving the tapestry of comorbidity. Ann Fam Med 2006;4:101–3.
. Adapting clinical guidelines to take account of multimorbidity. BMJ 2012;345:e6341.
. Continuity of care: a multidisciplinary review. BMJ 2003;327:1219–21.
. Shared decision-making in the medical encounter: what does it mean? (or it takes at least two to tango). Soc Sci Med 1997;44:681–92.
. Shared decision-making in primary care: tailoring the Charles model to fit the context of general practice. Patient Educ Couns 2006;62:205–11.
. Redesigning the general practice consultation to improve care for patients with multimorbidity. BMJ 2012;345:e6202.
. Interventions for improving the adoption of shared decision making by healthcare professionals. Cochrane Database Syst Rev 2010;5:CD006732.
. Barriers and facilitators to implementing shared decision-making in clinical practice: update of a systematic review of health professionals’ perceptions. Patient Educ Couns 2008;73:526–35.
. Aging with multimorbidity: a systematic review of the literature. Ageing Res Rev 2011;10:430–9. Contributors CS designed the study, undertook the systematic review, carried out the data extraction, analysis and interpretation and wrote the manuscript. SMH provided guidance on qualitative research methods, participated in the analysis and interpretation of results and reviewed the manuscript. JB participated in the design of the systematic review and critical review of the manuscript. CB participated in the design of the review, analysis and interpretation of results and critical review of the manuscript. CS is the guarantor. Funding Health Research Board, Ireland, grant numbers HRB*NSAFP/2011/3 (CS) and HRB*ICE/2012/12 (SMH). Competing interests CS is on an academic fellowship programme sponsored by the Health Research Board and the Health Service Executive, Ireland. SMH is a postdoctoral research fellow funded by the Health Research Board Interdisciplinary Capacity Enhancement Awards. Data sharing statement Additional data on the assessment of quality of included papers are available from csinnott@ucc.ie.